"For me, it’s the satisfaction of working with like-minded colleagues, talking to customers and constant variety in my job that keeps me on my toes..."
I’ve been here 14 years now and still every day is different and every day I’m learning new things – whether it’s organising a photo shoot, refining our social media strategy or getting to grips with search engine optimisation. There can’t be many jobs where you’re constantly stretched and feel that you’re developing new skills all the time. These days there are so many ways to find out about Enterprise and it’s important that anyone who’s thinking about joining the company does their homework. So check out our website, read our blogs, follow us on social media and check out the career paths and stories here to get a real flavour of what the company’s like and a sense of whether we can offer the kind of career you’re looking for. For me, it’s the satisfaction of working with like-minded colleagues, talking to customers and constant variety in my job that keeps me on my toes. "There are so many exciting prospects at Enterprise..."
I've been with Enterprise for just over two years and I'm currently the Manager of our Uckfield branch. Like the vast majority of my colleagues, as well as our current CEO, I started out as a Management Trainee on the graduate programme. What brought me here is the customer service aspect of the job. It is something I've always really loved and thought it important in a business, so seeing how integral it was to Enterprise really drove me to apply. If you enjoy your job, your customers are going to be happy too, and that's something Enterprise values from their employees. Enterprise is also a company that believes in rewarding your efforts, and they really look after you. We have regular social events so we get to spend some time with the team, and the last one I went to was a branch barbecue – we had it on a Saturday with all the local branches, and it was great fun. 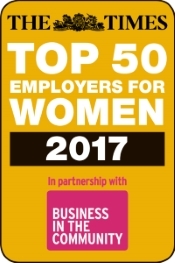 It's also one of reasons why Enterprise has been included in The Times' "Top 50 Places where Women Want to Work" for 12 years in a row, as well as being voted TARGETJobs Graduate Employer of the Year in 2013 and 2016, and included in the first ever Social Mobility Employer Index. And these are only a few of the awards we won recently! For somebody considering joining us at Enterprise, I'd tell them it's a great opportunity and not to be afraid to ask too many questions. I'd ask them to do research around the business and really find out what's important to them. If you're after career progression, you've come to the right place. In just over two years I've already been promoted three times and I'm now running my own branch. There are so many exciting prospects at Enterprise and you just don't know where you could end up. Our Management Training Programme allows you to develop the skills you'll need to move into senior management. With our help, you'll hone your talents in key areas such as sales and marketing, customer service and finance. It's entirely possible to be a Branch Manager within just two years of starting, and it really is up to you how fast you move up. Throughout the scheme, there's a series of carefully monitored tests and evaluations, after which you'll receive pay increases, rewards, and more opportunities for promotion, working your way up to Branch Manager, then Area Manager, City Manager and beyond. You'll also have the opportunity to specialise if you find an area of the business you're particularly interested in, such as HR, Marketing or Finance. To find out more and apply online, visit our website. We recruit people on an on-going basis throughout the year. So whenever you’re ready to apply, we’re ready to talk to you. Click on the Latest Jobs tab to view our latest vacancies. Once there, complete the forms and we’ll be in touch with you shortly. Your initial application should take less than 30 minutes to complete. It’s a good idea to have an electronic copy of your CV handy, so you can copy and paste the relevant parts into the application form. Do I have to fill in the online application form? Can't I just send you a copy of my CV? Yes, you need to complete the online application. It actually makes it easier for both of us. It means you can update your personal and employment information whenever you wish, and we can assess you application much quicker than if you applied by using a CV. What is the next step, after I've applied online? You can read more about our application process here. What exactly does the Management Training Programme involve? When you join us as a Management Trainee, you’ll start off by taking part in a classroom-based orientation session, before being assigned to a branch office for some hands-on business training. This will include management skills, finance, marketing, operations, sales, and customer service. You’ll also learn valuable business skills from capable mentors who were once in your shoes. And within a year you could be promoted to Assistant Manager. From then on, you’ll also receive a percentage of the profits generated by your branch, which means you could earn more, thanks to our performance-based culture. What qualifications do I need to get on the management training programme? We’re ideally looking for university graduates, but will also consider applications from non-graduates if you have experience gained in a previous customer service, management or sales role. Either way, you should be interested in management, sales as well as working with people. A strong work ethic, good communication skills and enjoying working as part of a team are also essential to this role. Why do I need a driving licence to work for Enterprise Rent-A-Car? We require employees for our placement and management programmes to have a full licence for the country in which they are working. That’s because a portion of the role involves being on the road – making sales calls, picking up customers and going to visit customers. If you don’t have a licence because of a disability, we are certainly able to accommodate you. Please contact your nearest Enterprise Rent-A-Car recruiting team who will be able to help you. The Popularity Index is a gauge which highlights how competitive it is to gain employment with Enterprise Rent-A-Car. Knowing a company is very popular may help you adapt your application in order to give yourself the best chance of being called for interview. A good degree in any subject.